I found this article very interesting the first time I featured it, and it was nice to revisit it. My vampiric tale of Pride and Prejudice used a variety of means to defeat the vampire, George Wickham. Darcy, Elizabeth, and Colonel Fitzwilliam used silver, a crucifix, ash staves, millet, salt, coins in the mouth, scatterings of the ashes of the vampire’s grave, stakes, etc. Book Blurb: Vampire Darcy’s Desire presents Jane Austen’s Pride and Prejudice as a heart-pounding vampire romance filled with passion and danger. As a man, Darcy yearns for Elizabeth, but as a vampire, he is also driven to possess her. Uncontrollably drawn to each other, they are forced to confront a different kind of “pride” and his enemy’s “prejudice,” while wrestling with the seductive power of forbidden love. Evil forces, led by George Wickham, the purveyor of the curse, attack from all sides, and Darcy learns his only hope to survive is to align himself with Elizabeth, who is uncannily astute is how to defeat Wickham, a demon determined to destroy each generation of Darcys. “Someone looks for you, Darcy.” Wickham paced the cell in agitation. Darcy refused to react. He forced his breathing to remain even, but the joy of knowing another knew of his capture played havoc with his composure. He kept his eyes closed, fearing Wickham could read his countenance. Wickham walked away casually. “It was your beautiful wife, Mrs. Darcy.” Wickham straddled a straight-backed chair, turning it to where he could watch Darcy’s reaction. “Likely a stranger enticed by tales of the unknown.” Darcy hoped to convince his enemy to ignore the incursion. At first the words were offensive, but then Darcy’s pity replaced his anger. Despite his personal loathing of Wickham’s baseness, Darcy felt empathy for what once must have been a proud and handsome man–a man who loved a woman too well and lost everything because of it. “I have not tasted it,” Darcy spoke softly, not wishing to break the understanding between them. Wickham watched as Darcy once more took up his resigned vigil against the wall. An understanding passed between them. Darcy imagined that in another lifetime, he and Wickham might even be friends, but circumstances prevented that idea ever becoming a reality. Darcy respected Wickham as much as he abhorred him. Darcy attempted to relax the pain in his shoulders and arms. Wickham imprisoned him twenty-four hours prior, and other than the occasional break Darcy negotiated to meet his personal needs, he remained restrained by the shackles. Wickham, as he suspected, brought him no food or drink. He was to die of starvation, and Darcy accepted it. “You will bring me notice of when we meet on the battlefield,” he mumbled, closing his eyes to welcome sleep. He heard the door close and knew when the bolt slid into the latch, but Darcy remained in repose. Images of Elizabeth filled his mind. Their time together was all that brought him peace. This entry was posted in Africa, book excerpts, book release, excerpt, gothic and paranormal, Jane Austen, Pride and Prejudice, Regency romance, romance, Scotland, Ulysses Press, vampires and tagged book excerpt, giveaway, Jane Austen, paranormal, Pride and Prejudice, Regina Jeffers, Vampire Darcy's Desire, vampires. Bookmark the permalink. 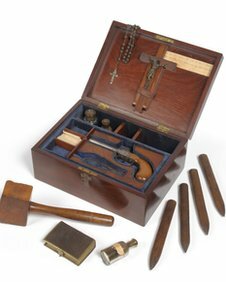 1 Response to What Could Be in a 19th Century Vampire-Slaying Kit?